So I previously have removed/suspended all my UI-heavy features — upgrades, unlockable and changeable loadout, goals. 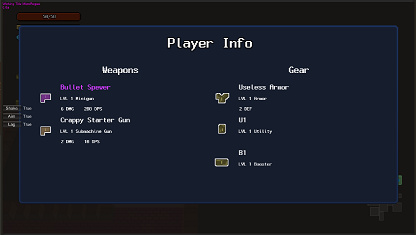 Of the four player information UI/HUD panels, I only have the (unfinished) stats tab left, which is now basically the current loadout. 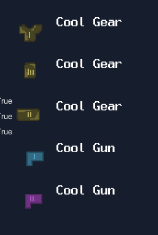 So I need to get that working and presentable, because I currently don’t have a way to properly explain to the player what gear they have and what it is or does. I would love to actually implement all the other features too for all the reasons I previously listed, but I am running out of time. I need to get this working fully before I commit to any new features. If I do do them, then I will need to design them UI-first, because UI is wasting literally weeks. I can probably add more stats and info and whatnot if I want to. But it’s already presentable, so first, let me do the gear in the same manner. As with other things, I want some more collectible stuff. I am just not sure what to do with it exactly. Repair, may be? And that about wraps it up for the panel. The biggest design challenge here is to keep the features to minimum, have the fewest possible UI elements, and just generally not add more work for myself than necessary.